Published Jun 15, 2015 by Pearson IT Certification. Part of the LiveLessons series. NCLEX-RN Review Complete Video Course is an engaging self-paced video training solution that provides learners with more than 10 hours of personal, visual instruction from a team of nurse educators who have more than 26 years of practical teaching experience. Through the use of topic-focused instructional videos, you will gain an in depth understanding of the NCLEX-RN exam and what you need to know to pass the exam and gain your nursing license. NCLEX-RN® Review Complete Video Course is an engaging self-paced video review that provides learners with more than 10 hours of content in each of the areas tested on the NCLEX-RN® exam from a team of nurse educators who have more than 26 years experience in classroom and clinical instruction. Through the use of topic-focused instructional videos, you will review testing strategies to increase your success on the NCLEX-RN® exam as well as major topics from Medical Surgical Nursing, Maternal Newborn Nursing, Nursing of Children, and Psychiatric Mental Health Nursing. Pharmacology, related nursing skills, and principles of nutrition are included with each section. 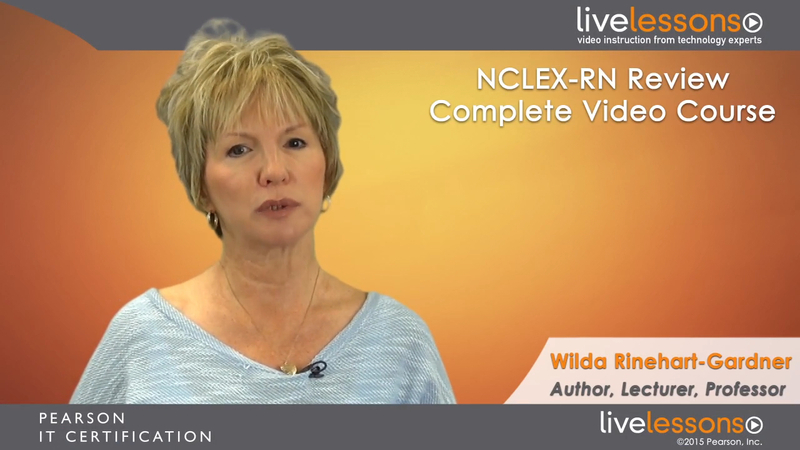 The NCLEX-RN® Review Complete Video Course blends the ideal level of discussion, graphics, and testing into an easily managed format for study. Whether you are the nursing graduate preparing for the NCLEX-RN® or a student nurse preparing for a unit exam we know you will find this a valuable source of information. The NCLEX-RN® Review Complete Video Course may be used alone or in conjunction with one of the NCLEX-RN® Exam Cram texts. According to the Centers for Disease Control, lung disease is one of the leading causes of death in persons 55—65 years of age living in the United States. It is estimated that more than 35 million Americans live with chronic lung disease. Some of these diseases, such as asbestosis, are the result of occupational exposure and carry associated risks of lung cancer. In this lesson, we will look at the acute life threatening disorders (ARDS and pulmonary embolus) as well as the common noninfectious disorders that contribute to chronic lung disease, infectious diseases of the lower respiratory tract, and emerging pulmonary infections.